I was supposed to be in Hebron, CT yesterday morning attending CT NEMBA's Fall Fiesta at Greyville Falls Park enjoying some really wild singletrack and awesome trails. However, a family birthday celebration was more important so my consolation prize was to finally take the 'Horse out to the Dingle Brook Trails in North Newtown and Brookfield. I used to call this place Burr Farm because the section in Brookfield is called just that but the trails run along Dingle Brook and I think that name is more fitting for the entire area. Below is a map that I did for Bikerag.com back in 2005. Nice thing about this map is it does give you a better idea where this place is and where to park. The GPSVisualizer maps are great to show the tracks on the topography but not really good if you are looking to find the parking areas. At some point I might try integrating more interactive maps but haven't quite found the right online provider yet. The trails in the Newtown portion of the area are a combination of old farming roads and newer but older ATV trails. Fortunately, no body rides quads in here anymore. Now these trails are ridden mainly by horses and an occaisional local mountain biker, such as myself or Frank. On yesterday morning's ride, though, the only tracks that I did notice were from horses. I think Frank is digging the Upper Gussy Trail so much now that he doesn't ride here at all. 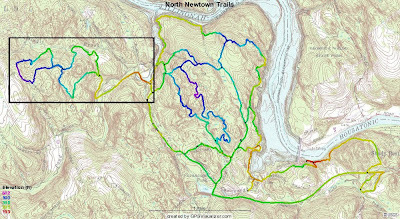 In the Newtown section, most of the trails are pretty well defined and others are you just have to know where to go. However, on the Brookfield side, the trail is blazed with blue paint. Crossing from Newtown to Brookfield, the route breaks off into two options. 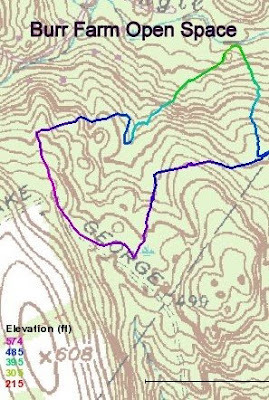 Continue following the blue blazes on a washed out, fall line trail, or take the bypass which initially is a little sketchy to follow at first but then opens into an old farming road which eventually takes you to the old right of way that comes off of Lake George Road. Park at the Pond Brook Boat Ramp off of Hanover Rd. Follow Pond Brook Road till you cross over a little brown or beige bridge and hang a right onto what seems like an old gravel driveway/road. It's blocked with debris to keeps the jeeps out. Follow that road in, it turns into a trail further in and is marked with engineer tape. The best ride is to do the loop in Newtown counter clockwise and loop in Brookfield clockwise. Both loops and the stretch down Pond Brook is about 6 miles. The initial part of the trail is pretty soft and can get rather muddy in places but then it passes through a stone wall and opens into a field. I think this first open field is owned by Newtown Forestry Association but I am not entirely sure. Need to look at the property maps again. There is potential for another trail looping that property and my friend Tom who rides his horse on these trails has been looking at it. Who knows, once the Gussy Trail is completed I might set my sights over here. You have to climb up the first field and it's pretty overgrown. You pass through another stone wall and the trail cuts right through middle of the next field. I believe this field is owned by the yellow house off to the east of this location. As you can see in the picture below, at 7 AM it was pretty foggy out and a cool 47 degrees. Even though it's Sunday, I am still wearing orange because this is mostly private land and even though Sunday hunting is still forbidden, I don't take any chances. I round this old fence post along the first section of trail that skirts Dingle Brook. I never noticed it before but it still has the old iron holders for the rails. As I mentioned earlier, the second loop encompasses Brookfield's Burr Farm Open Space area. The trail pops out in an residential area and then cuts shaprly back into the woods. This part of the trail has some really steep descents and that is why I recommend riding this section clockwise. Clearly, mountain biking was not on the minds of the person who created this trail. In fact, the trail runs right into a stone wall at one point and on the other side is a stream crossing. Twenty yards from the trail crossing I found an old farmer's ford through the stream and cleared some fallen branches to open it up. Never noticed this before but there appears to be a white marker on the tree below. Of course, that could be flower from the Hash House Harriers. They have been known to run in here from time to time. I added a few flat rocks as a precaution over some of the areas that could get muddy after a little more use. The stream bed is really solid so you can hammer right through it. Picking up the trail again is easy, just keep curving to your till you pick it up again. Once you get down to Dingle Brook this is a little bench which makes for an excellent photo opportunity. That blaze orange really stands out in the woods! From the bench you have to climb back up. It's mostly rideable with the exception of a few downed trees. I am surprised at how will I can climb these days. When you get back into Newtown after the Brookfield loop, you could always follow the trail the way back you came but I am not a big fan of that. There is another trail that heads east from the junction of where you go to the Brookfield portion. There is a trail that is marked with a faded green/yellow piece of engineer tape. You basically have to look for the depression in the ground to realize there is a trail there. You can follow this trail if you miss the turn off for this little bypass section which will eventually bring you around to where you want to be. The Newtown section is not clearly marked and many trails end up in people's back yards. So your best bet is to download this track from Crankfire.com if you ever want to try this alone or contact me for a tour. that's a crazy helmet you've got. Orange season! It's a Giro MX helmet from a few years back. It's my cold weather helmet because it has little vents and gets really hot.